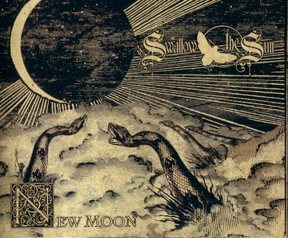 Finnish doom metal band Swallow the Sun has a privileged position in their national metal scene. Backed up by Spinefarm Records, they introduce us their new album New Moon . But actually, nothing is much new here. The gloomy and vicious atmosphere is present all over the album, and the cutting guitar riffs are leading you to feel depressed in a room just lighted with candlelight. Even slow tempo songs like the “ballad” Sleepless Swans is not something that you would really play to cheer up you future partner in a romantic date. However, for old fans of the band, and in general for fans of doom and metal genres, this album is well produced, mastered and executed. Mikko Kotamäki’s singing skills are at a high level here, he knows where to push his limits, and the orchestration is pretty awesome during some tracks. But it always happens the same to me when I listen to doom metal, I prefer to listen to just the music without the screams. Consider me an old metal school fan, but I cannot avoid it. Not a bad effort for the Finnish band, if you are into this kind of sounds. But for the lovers of multicolor rock that transmit good vibes, you better skip this one.